Tutorial 114 demonstrated how to use the rectangular drawing tool to draw colored boxes or zones on a chart. The rectangles were drawn across the total width of the chart and used BNPoint (bar number point) objects to position the rectangles. The tutorial builds on tutorial 114 but demonstrates how to draw boxes between particular times each day. Rather than using BNPoint objects, it uses DTPoint (datetime point) objects. 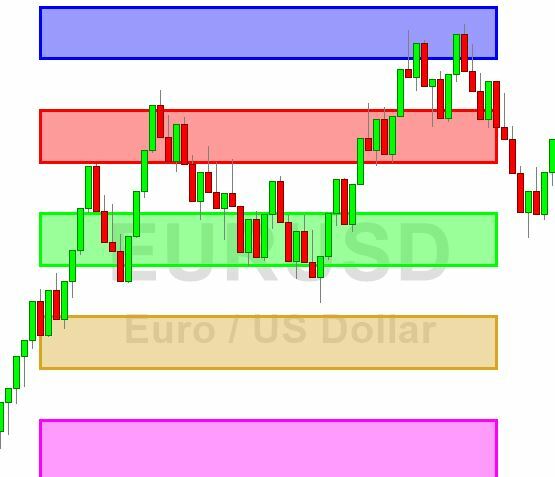 Drawing boxes might be useful if you wished to highlight trading activities and levels between certain times. Alternatively, although the times and price levels in this program are specified as user inputs, you could use the techniques built into this tutorial in a more sophisticated program that calculated levels. The tutorial was developed using TradeStation 9.5 (update 15). The tutorial is in response to a customer request. Tutorial 114 (DT) applied to a 5 minute EURUSD chart showing two time periods the previous day and a completed time period and a time period in formation on the current day. The tutorial program uses the rectangle class with several of its properties and the create class. The tutorial demonstrates the creation of a method to create the rectangles, which is called from several places in the program. Tutorial 114 (DT) creates five boxes. In the screen grabs on this page the rectangles have been drawn at arbitrary levels. One of the problems in developing this program is that, while it is easy to draw the boxes historically, drawing them in real time requires extra care. The end point may not be visible on the chart and hence has to be managed with the end point being set when that bar appears on the chart. So, for example, assume one of our time periods begins at 1200 and ends at 2000, but when the program is applied to the chart only the period from 0900 to 1500 is visible on the chart. The program starts drawing the zones at 1200 but initially extends to the right (because we can only see up to 1500). As the day progresses bars beyond 1500 appear and these are encompassed by the zone (because it is extended to the right), however, at 2000 the program sets the extend to the right attribute to FALSE and sets the end time of the box to 2000. With this program it is easy to draw significant numbers of drawing objects. TradeStation limits the number of drawing objects that can be drawn on a chart. This tutorial uses the ExtRight property of the Rectangle class. This only became available in release 14 of TradeStation 9.5. These are reflected accurately on the above chart. Note: If a bar does not exit for a specific time, the zone is drawn from/to the following bar. For example, in the above image there was not a bar drawn at 1457.02, so the box was drawn to end at 1457.20. Note that the time can be entered either in HHMM format, eg 1615, or in HHMM.SS format, e.g. 1500.12. Tutorial 114 (DT) is available for IMMEDIATE download for $19.95 by clicking the ‘add to cart’ button. After download the programs can be opened, you will be able to see the program code and modify it if you wish. After purchase you will be redirected to a download page, so don’t close the browser. The download ELD includes _Tutorial 114 (DT) an EasyLanguage show me study. Tutorial 114 (DT) was developed for TradeStation 9.5 (update 15) and, unfortunately, will not work with MultiCharts.